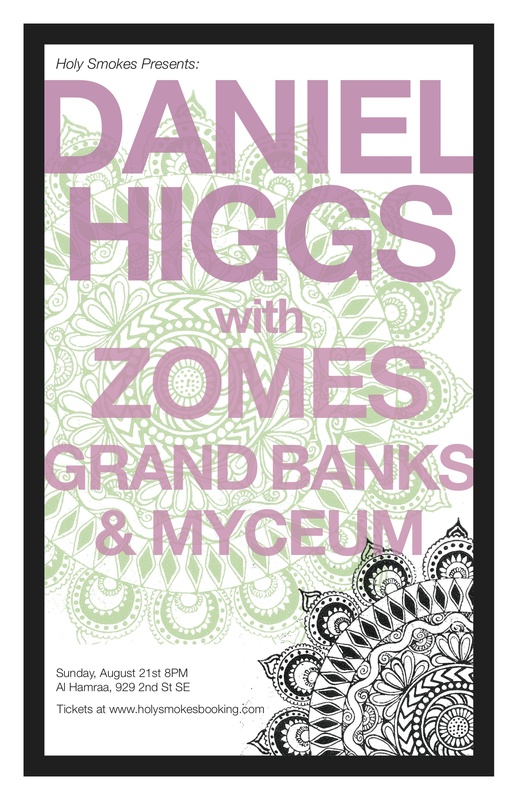 Higgs, Zomes, Grand Banks & Myceum at al-Hamraa! The headlining acts are two former members of Lungfish, the long-running Baltimore-based band who put out a string of alarmingly consistent albums between the late 80’s and their informal dissolution a few years ago. I had long been told they were an amazing band, but only recently have I bothered to check them out, and now I can say that I totally understand why people are obsessed with their music because I’m becoming obsessed with it myself. They often sound(ed) a lot like the more thoughtful, deconstructed parts of their labelmates Fugazi, except that they’ve honed that sound into hypnotically repetitive songs that often sounded more like incantations or mantras than traditional verse-chorus rock songs; a large part of what made them so powerful were the lyrics, sung by Daniel Higgs, who was able to infuse clever, cryptic, and sometimes provocative proclamations with a level of intensity that often resembled a sort of religious ecstasy (some of my favorite decrees from the world of Lungfish: “Oppress Yourself” and “Love Will Ruin Your Mind”). But one of the coolest things about Lungfish was that they were also able to maintain that same level of focus and intensity on their many instrumental passages. They were a pretty remarkable band. His former bandmate, guitarist Asa Osbourne, has also had a prolific recent career performing as Zomes; while the technique is somewhat different (it’s more “electronic,” incorporating keyboards, loops, and apparently cassette tapes), his Zomes material often has the same sort of repetitive focus and overall aesthetic as the best Lungfish instrumentals. Charlottesville musician Tyler Magill has long been a huge fan of Lungfish — he penned an article in the third issue of Mildred Pierce entitled “the Gospel of Lungfish,” and has also proclaimed “my wife has agreed to let me name a child Higgs, should another be conjured” — and you may have even heard him perform a Lungfish cover or two, with his current band Mss. (whom, incidentally, played a fantastic show opening for Six Organs the other night). So it’s only fitting that Tyler’s old(er) band, Grand Banks, will be reuniting to play this show tonight. Grand Banks is the duo of Tyler on keyboard and vocals, and guitar by Davis Salisbury, a great musician and a fine fellow whom I’m glad to say has recently returned to Charlottesville after several years in New York. If you ever caught a Grand Banks show you know how special they were, and if you missed them entirely, now is your chance. Rounding out the bill is Charlottesville musician Scott Ritchie, who will be performing some of his satisfying solo electronic-drone work as Myceum. Scott’s last set was pretty great: a set a the Pigeon Hole performed under the name Errantry, although I’m not entirely sure what distinguished that project from Myceum (the use of a guitar, perhaps?) or whether tonight’s set will be similar or substantially different. Anyway, it’ll definitely be worth hearing. So that’s the fantastic line-up of bands tonight; the show is at Al-Hamraa (the Moroccan restaurant in the Ix Building), the doors open at 8pm, and the cover charge is a reasonable $7. Just want to thank all those who came out to the show. Feels good to be back playing music in Charlottesville, hope everyone had a good time. Higgs is something else, feel lucky to have played with him. yeah, what a nice night! I’m feeling “under the weather” this weekend, and was pretty out-of-it by the time Sunday night’s show rolled around… I was disoriented, sober, and full of painkillers, which made for a strange mood — BUT the evening’s music was actually perfectly peaceful and mellow, and more or less exactly what I needed at that moment. Scott’s Myceum set was a strange one, often staying in one place for a long period of time before making a really drastic shift to another aesthetic; it lacked the cohesiveness of last weeks’ superior Errantry set, but it was still an extremely nice palate-cleanser and clearer-of-brain-cobwebs, and I enjoyed it. Grand Banks played two songs, Tyler’s re-writing of “In Christ There is No East or West” as well as a nice version of “Good Luck Children for the Next 1000 Years” … it was a more subdued and mellow Grand Banks than the drone-behemoth I sometimes recall, but it was no less pleasant or well-executed; nice to see those boys playing together again. Zomes’ set was perhaps even mellower (though, like I said that suited my temperment perfectly); hearing his records I had assumed a lot of what he did was accomplished through looping and various recording techniques, so it was kind of a pleasant surprise to learn that a) it’s all performed live without looping, and b) that sound comes 100% from his choice of instruments; his records are not a fuzzy, lo-fi rendering of what he’s performing, but actually a crystal-clear document of music that just sounds that woozy and warbly to begin with. my somewhat unsubstantiated prediction that Higgs would be doing some kind of “spoken word” thing turned out to be 85% incorrect. what he did was played a western Banjo like it was a Sitar — or some other type of Eastern stringed instrument I wouldn’t be able to identify — somewhat expertly, for about 45 minutes, recasting the strategies of early-20th c. American c&w / hillbilly music in the format of endless ecstatic Indian ragas. I guess most people think of Higgs as a vocalist, but the dude has some SERIOUS chops, I kept thinking of folks like Richard Bishop or Ben from Six Organs, though his style was quite distinct from each of those two; in fact, his blending of easternism and westernisms reminded me most of the late great Jack Rose in its attitude and approach, though you’d never in a million years mistake one for the other. … then, about 45 minutes into the set, he leans over to the mic for the first time, and quietly asks — while still eking out a masterful performance on the banjo — “any of you guys watched the new Planet of the Apes movie yet?” which might be the funniest and most incongruous extended set-up/punchline I’ve heard from a performer in quite some time. anyhow, he continued to digress about “Planet of the Apes” for a few minutes before launching into a proper (and solemn) song or two, and the whole thing was pretty wonderful: a perfect mix of things I might have expected and things I never would have guessed. Thanks for the nice words, James. It would probably be surprising to most folks how difficult it might be to incorporate the ideas of “pleasant” and “well-executed” into the DNA of Grand Banks, especially knowing that the drone-behemoth is always there. As far as Higgs goes, there are some astounding recordings of his banjo playing as well. I get confused as to which of his solo records is which (the style of music can drastically differ record to record), but Tyler is a good resource as to where to dig in to hear some more. He is a wildly exciting player to me. But yeah, the “Planet of the Apes” interlude was totally charming and surreal at the same time. The man truly is a conjurer. I recall a day about the same time when an enrite poultry crate of chicken necks met the axe. Must have been a big corn boil and fried chicken fest, or something. Headless chickens running amok all over the yard. And then it was time to pluck ’em. A steaming laundry tub filled with scalding hot water, it soon turned bloody red. I can smell it now.Not trying to one-up you, Simon. Just sharing common experiences.